The Big 5 Kuwait will celebrate the construction frenzy in progress in the state, spotlighting the latest technologies and state-of-the-art products and solutions that will go into new buildings, roads, bridges, super-markets, railway stations and industrial and airport facilities. Kuwait is said to have projects worth $188 billion underway in various stages of planning and construction and the outlook is that it is poised for significant growth. The demand for high-quality infrastructure along with upscale residential and commercial properties can be seen in several multi-billion dollar projects including: the $15 billion Al Zour New Refinery Project, $7 billion Kuwait Metro project, $6.2 billion motorway construction, $3.3 billion Kuwait International Airport and $2.6 billion Subiya Causeway. The third edition of The Big 5 Kuwait will be held from September 14 - 16 at the Kuwait International Fair. One new feature is the addition of a hall dedicated to Building Interiors products. The move is in response to the 2014 Visitor Survey, where 41 per cent of visitors in 2014 requested to see more interiors products. Building Interiors products command a high demand in Kuwait. The new hall will be an exclusive showcase of products from the segments such as bathroom accessories, ceilings partitions, ceramics and porcelain, flooring, sanitary ware, showers, fitted furniture, sinks, bathtubs, and wall coverings. The Big 5 Kuwait 2015 will provide an ideal venue for regional and international manufacturers and distributors of related goods and services to showcase their products to the now proven lucrative Kuwaiti market. At the same time, it will offer local buyers easy access to these new and innovative products. The event is the largest building and construction fair in Kuwait, attracting visitors from Kuwait, Saudi, Bahrain and UAE. It addresses the needs of the country’s burgeoning construction sector. In 2014, it attracted over 5,000 industry professionals, including architects, engineers, interior designers, contractors and developers looking to source products to service building and infrastructure projects during the exhibition’s three-day run. The Big 5 Kuwait complements the growing momentum in the Kuwaiti construction sector by offering new concepts and solutions in building technology. The fair’s organiser, dmg events Middle East and Asia, has been operating in the region since 1995. 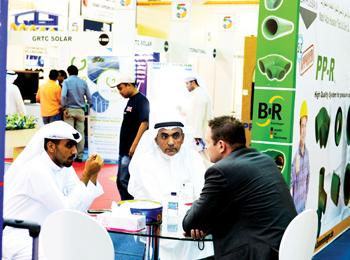 With more than 40 market-leading exhibitions for the global energy, construction, coatings, hospitality and interior design industries, dmg events organises many of the world’s most important shows including Adipec (global energy industry), The Big 5 (construction industry), Index (interior design industry) and The Hotel Show (the hospitality industry).